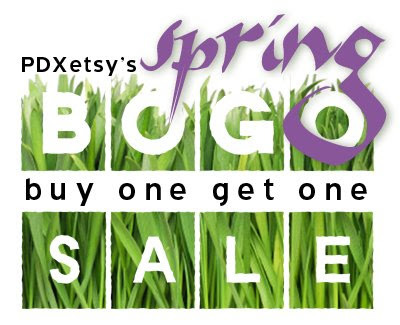 THIS WEEKEND ONLY The PDX Etsy BOGO SALE! All day SALE March 15th and 16th (Saturday and Sunday, Pacific Standard Time)! Buy anything in my shop and get a second item of equal or lesser value for FREE! (FOR REALS! Any item in my shop!) Purchase both items of your choice through etsy, and then I will send you an adjusted paypal invoice discounting the free item's cost. Shipping charges still apply as needed to get it to you. The PDX Etsy Street Team is a group of Portland, Ore. (and surrounding areas) artisans and crafters dedicated to making and promoting high-quality handmade goods. Portland’s Etsy Street Team puts you in touch with local artists and crafters from Etsy.com and lets you keep track of the awesome Etsy events that will be going on in Portland. Many PDX Etsy Team members are all having sales this weekend. Don’t miss out on these great deals – two days only! Shop now, and come back later to get some great deals!